The trend to physical degeneration is reversible, and in this case, even with only implementing some of the dietary recommendations we make! So far, these 2 girls have wider faces and palates than their parents. They also have no dental decay and perfect vision, unlike their parents. Click on each image to see a larger view of their wide, smiling faces. 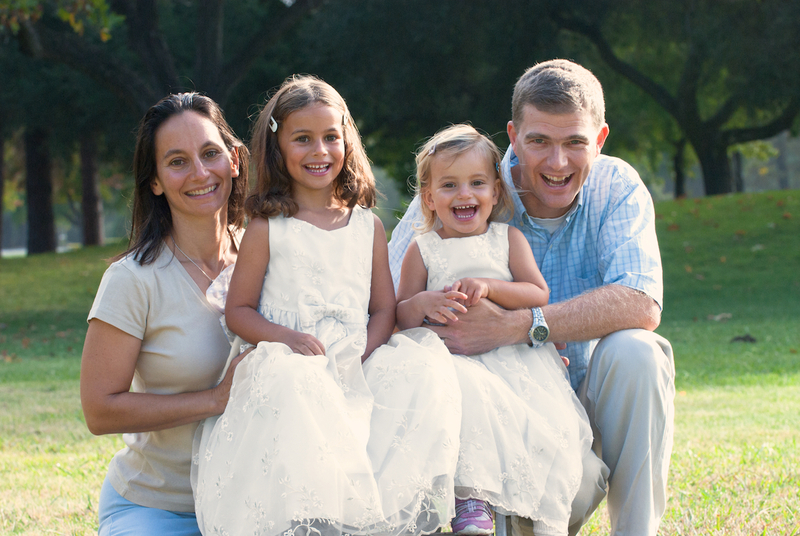 Meet the Luschas Family in the photograph below – Susan, the mother, pictured at age 37, Manuel Luschas, the father at age 41 and their daughters Soraya, the older sister captured at just about 6 and Sabrina, the younger sister at just about 3 years of age. Click on the image to view a larger version. Susan shares, “Although I was raised on the Standard American Diet, in my early 30s I converted to the Weston A. Price Foundation recommended diet. My two daughters eat a traditional diet which consists of 1 quart of bone broth per day, 1-2 servings of fermented foods per day, grass-fed meats including organ meats 1-2 meals per week, eggs from our chickens, and vegetables from our garden. They still have their baby teeth, but you can already see that their faces are wider than mine and their palate has properly developed. I had orthodontic appliances and braces as a child. I had severe astigmatism as a toddler and I was fitted with glasses at age 4. Their father also grew up on the Standard American Diet and has a mouth full of cavities and -4 vision. 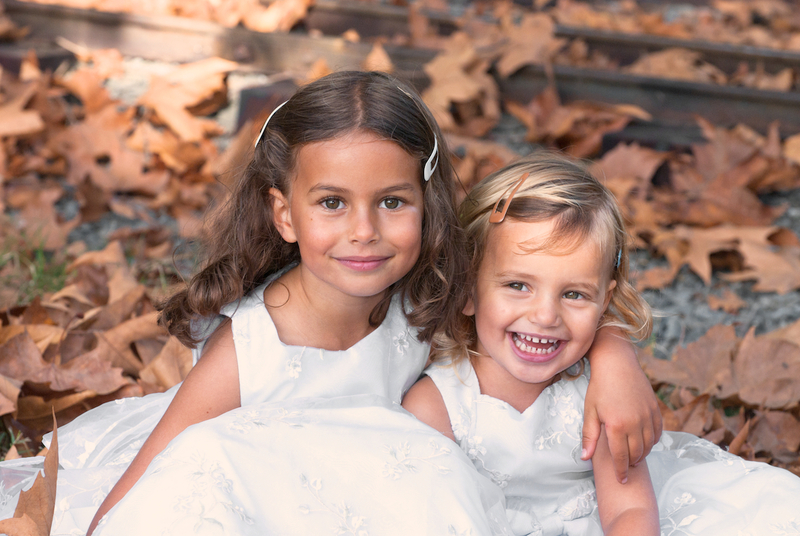 Both of our children have cavity-free mouths and perfect vision. Best of all, they exhibit no tantrums, meltdowns, or behavior problems. They are the happiest kids we know! They are 3 years and 1 month apart. I had been moving towards a traditional diet for a few years before I conceived, it’s hard to say exactly when, but I became stricter over time. With the older child, I had horrible sugar cravings and low iron, so I did occasionally eat lots of chocolate and sugar during the pregnancy, but I also ate lots of traditional food. My pregnancy diet with the 2nd child was better but still not perfect. Turns out I had thyroid issues while pregnant but they were never properly diagnosed. This was causing my low iron and sugar cravings. I worked through both pregnancies too so I had to eat something to keep me going. I didn’t start eating lots of organ meats and ferments until after they were born. So their early diets although mostly traditional weren’t perfect. For the last 3 years or so their diets have been near perfect and very strict. It took many years and gastrointestinal illness of the oldest daughter for us to get there though. The good news is, now we are all the healthiest that we have ever been. Now we eat everything on the list, minus grains, minus dairy, minus fruit, minus beet kvass. Eggs from our chickens are soy and corn free. We are also just now cutting out all fish because despite eating the most expensive wild non-mercury fish, we all have alarmingly high levels of mercury. I didn’t start properly preparing grains until after the kids were born. Then we finally just stopped eating them all together because we felt better without grains in our diet. So it’s ferments, meats, broth, veggies. Note that in the picture of me with my older daughter you can see how my jaw/palate never properly developed but my daughter’s has! Gorgeous! A testament to what caring about your family’s food can mean for many generations to come. Right? 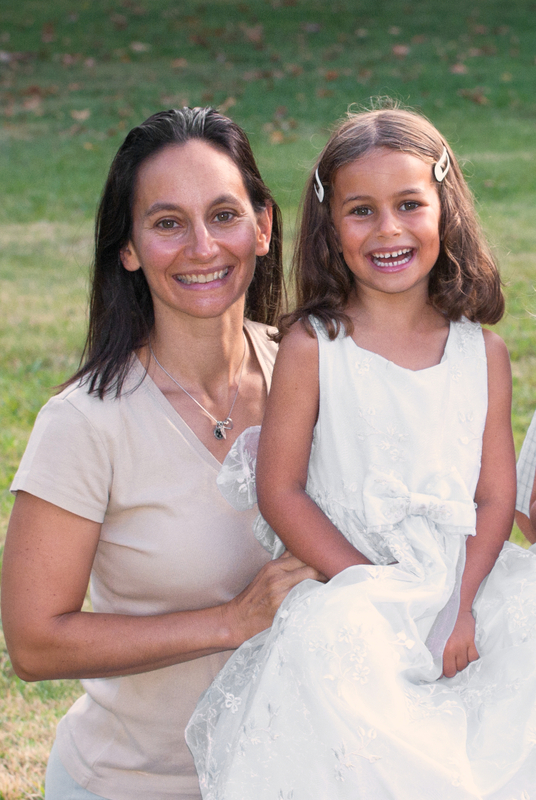 I think the girls are absolutely radiant – just beautiful with their wide beaming smiles. I found this testimonial so inspirational. How inspiring! My palate is pretty good – just a little crowded at the bottom, but my husband’s is awful. My mother in law keeps telling me that small palates run in their family so be prepared to spend on braces.I have three now and my nutrition has gotten better with each successive pregnancy. Both my girls seem to have nicely spaced teeth (it’s still a bit early to know for sure) and no cavities, even though we’re not the best about brushing. The baby still doesn’t have teeth. All their cousins have tooth decay and narrower palates. It just shows me that bad teeth is not genetic! Wonderful article! I can’t get over how beautiful those girls are! Inspiring is the word! I envision that Susan will enjoy reading your feedback, Riki! If you’re already eating the best fish you can find, maybe the mercury isn’t in the fish. Have you researched the area you live, to see if there are any factories or power plants nearby? Also, some vaccines that supposedly have no mercury actually have trace levels. Omega-3’s from fish are so important, it’s sad to have to cut them out. We just stay low on the food chain — shellfish and sardines, mainly. Yes, we have looked into the area we live, had our water tested, don’t use any beauty products (yes, we even shampoo with egg yolks!). 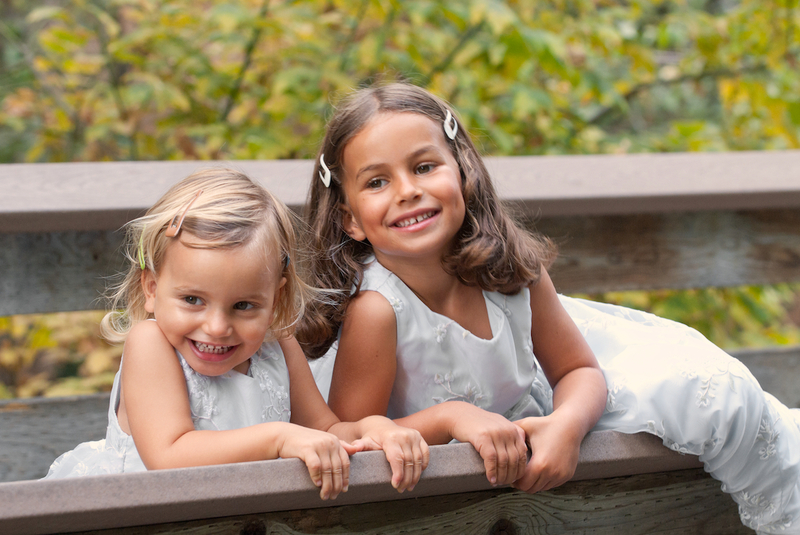 Both girls are unvaccinated. I have tests on myself from before and after we started eating fish every day, and my mercury excretion increased significantly post daily fish. The girls levels are so off the charts that doctors are amazed that they are not fully autistic or mentally retarded. We ate mostly wild shellfish, sardines, salmon & sole. I’ve come to the conclusion that our oceans are so polluted that we can’t even eat the ‘mercury-safe’ fish anymore. Susan – wow! That is of concern. What do you think of Raine’s article? Very long, I know. I will ask her to join this discussion. I think she’ll be interested in your first hand experience! Raine’s article doesn’t give any science about the levels of mercury in fish that we are consuming today. She refers to one study that focuses on cardiovascular health and ‘neurodevelopment’ in fetuses. Unfortunately these are not the typical symptoms of mercury poisoning, which would be autism, cancer, ADD, ADHD, chronic fatigue, fibromyalgia, etc. First, I really want to thank you, thank you, thank you for posting your story. I often worry about not being able to have dairy, and to see what your daughters have achieved without it is so encouraging. Congratulations! and thank you again for sharing! I wonder if you all have some mercury stored away, and the excess selenium in the fish allowed your body to get rid of it? Would be interesting to take some selenium supplements and see if you start dumping mercury again. Have you tried raw sushi-grade fish? The Green Pastures blog had a guest post by a ND where the raw fish didn’t lead to mercury absorption, but the cooked fish did. You could also try their fermented cod or skate liver oils which are tested to be low mercury and are a whole food. I am curious, where did you order the mercury test? I’m wondering if it is possible to have this done outside of going to a special naturopath, etc. This article was published three years ago, I know, but have you considered genetic testing for MTHFR?? If that is a factor here then your girls would have issues being able to eliminate heavy metals. My husband just discovered this at 26. He has had major health problems, despite a very good diet. His mercury is off the charts! We are using Oceans Alive marine phytoplankton that is tested for heavy metals, and helps his body detox and his liver function better. Wellnessmama.com has a fantastic review of the product. We use liquid zeolight from reults rna to bind to the metal and carry it out without taxing his organs so much, and he takes detox Epsom salt baths, and invests food grade bentonite clay. Slow process but we are seeing much improvement in the 6 months he has been doing this. He is about to add Protandim in to help his body over ride the MTHFR issue. We have heard it is very effective for this. Anyway, just a thought. Beautiful beautiful family!! The Luschas Family did a fantastic job! The time it takes just to LEARN and understand all these nutrition principles is quite a task, let alone implementing them. Bravo! And thank you Sandrine for constantly searching for these great inspirational stories and documentation of how we can reverse “The Trend”. As much as I want to be excited over this…and I am happy to know families are wising up out there and this is way better than what we do…I can’t help but think…your kids are still SO so so young and just because they don’t have vision problems now, doesn’t mean they are immune. My daughter didn’t get diagnosed with vision problems until the age of 8 and also just now has her first cavities. She eats MUCH better than I ever did as a child yet I never had a single one until I was pregnant with her at the age of 27. I don’t want to be discouraging though I sound like I am, I just don’t think the diet has been followed long enough to really have much of a testimony to go along with it. Keep it up though! You are way ahead of most other families out there. We have several other such testimonials we will also publish. Those children are gorgeous! I’m just so jealous! My son is pretty cute at age four but his head is small like mine and my husband’s. His baby teeth have no spaces like they should. I know he is headed for orthodontics :(. I ate poorly when pregnant with him. I wish I could have kept up my preconception diet as it was decent with lots of greens, seafood, whole milk yogurt and butter, but my morning sickness turned me toward saltines, pretzels and Ensure. I didn’t know about traditional diets then. Hoping for another child soon. If the next one comes with a wider palate then I will know it’s from eating traditional foods! a big difference in their children’s dental situation. Quite frankly, I feel eliminating grains, making sure they get enough vitamins A, D, and K2 in fermented cod liver oil / vitamin butter blend, organ meats, egg yolks, fermented foods is key. He still has a lot of growing to do!!!! There’s so much you can do to nourish all the growth he has left. Don’t be discouraged !!! Thanks Alex. He eats as well as I can get him, too. Lots of raw milk/yogurt/kefir. I sneak egg yolks where I can. No grain. No sugar. FCLO every day. Sneak in liver when I can. Bone broth. I’ve heard one story of a child’s adult teeth growing in on the outside of baby teeth (instead of directly over them) so there was actually enough room for them, but that’s the only story I’ve heard. I haven’t heard any stories of baby teeth starting to space out, only that you can go to an orthopedist to get the palate widened mechanically before all the adult teeth come in. If you know something I don’t, please fill me in! I’ve heard of a facial muscle massage technique used to widen the palate. I forget what it’s called – perhaps google it? Interesting. I’ll see if I can google that. I posted an experience from a yahoo group member on the Two Brothers page, and another mother posted a quote from Weston Price on his research widening palettes after birth. Check that page out. What is the Two Brothers page? I would love to read whatever you are referring, too! If you to RECENT POSTS, the column on the right side of this page, you’ll find the TWO BROTHERS posts. A nutritionist commented on that page about a orthodontic who’s had great success helping widen children’s jaws. Thank you so much for this information, Susan! I’m going to read it all. This is amazing and inspiring! I have an 8-month-old and am hoping our WAPF diet prevents her from needing glasses and braces. I needed both. Thanks to the Luschas family and the Nourishing Our Children campaign for sharing this. I absolutely love this story. It is inspiring for all of us!!! Thanks for your generosity in sharing! It looks like you didn’t take the high vitamin butter oil since you weren’t doing dairy…is that right? I know for myself I worry about not getting enough k2 without dairy, but it looks like you got more than enough from non dairy, grassfed, and fermented foods. Is this correct? No supplementing with k 2. Did you take FCLO? Correct, I didn’t take high vitamin butter oil or FCLO during pregnancy. After the girls were born, we all started FCLO. I don’t worry about K2 and I don’t subscribe to the notion that dairy needs to be in our diet. I’d never go latch on to a cow, nor did our ancestors. 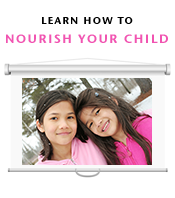 So far, neither my pediatrician nor myself have been able to identify any nutrient deficiencies in our children., and we’ve looked at blood & hair tests over many years. This is a wonderful article and I keep referring back to it to demonstrate to friends who are having babies how diet can so powerfully make a difference. To me, Susan has a wide mouth, and it’s hard to see what she’s talking about. This is fascinating and I’d like to be able to see better what an undeveloped palate looks like, especially in Susan’s case. Look at my lower jaw/chin area. It is way too narrow, and I have a horrible overbite. Next time I’ll smile more to show more of the lower jaw. Perhaps you can also see that my upper teeth all fit, but they are crammed together. My older one has her permanent teeth just coming in, so hopefully in a few years I’ll be able to update with more pictures. Hi Susan, I was wondering why you don’t eat fruit. No berries? Thank you again! an effective way to drop еxcess excess ԝеight for the two genders. The target for the five hundred сalories is high-protein foods. ver low caoorie diet for weigɦt loss.